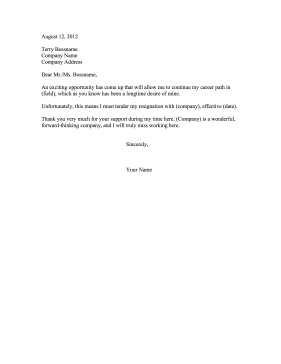 This simple resignation letter concerns an employee who is leaving for a career opportunity. An exciting opportunity has come up that will allow me to continue my career path in (field), which as you know has been a longtime desire of mine. Unfortunately, this means I must tender my resignation with (company), effective (date). Thank you very much for your support during my time here. (Company) is a wonderful, forward-thinking company, and I will truly miss working here.